Are you looking for innovative knee replacement options in Houston?? XP Knee Replacement is Here! Learn about the newest treatments available for you. click the "Learn about Oxford Button"
click the "Learn about Signature Custom" button. Doctor Likover has numerous patients coming from outside of Houston for the Oxford procedure. This instruction sheet will explain how our office cares for these patients. Several major advances have occurred in the field of total hip replacement in the last few years. The primary concern of the patient who requires a total hip replacement should be how well it works, and the length of time the implant will function and provide satisfactory results. This is the Oxford with it's patented, unique mobile meniscus replacement bearing in action! 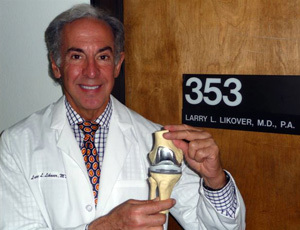 Dr. Larry Likover has been practicing orthopedics on the west side of Houston for 29 years performing knee replacement, hip replacement, shoulder replacement and treating ACL injuries. Dr. Likover completed the approved training course for implanting the Oxfordï¿½ Knee System; mastering the latest techniques to assist his patients with arthritic knee issues. Watch Dr. Likover and actual Oxford patients on television.